The harvest of leftover fruits and vegetables from a farm or garden. Do you want to volunteer to pick fruits and vegetables? Sign up to be a Clallam Gleaner! Pick fruits and veggies for you and your family and donate the rest to those in need. Sign up to receive the online gleaning newsletter to find out what fruit and vegetables are available for harvest each week during the growing season. 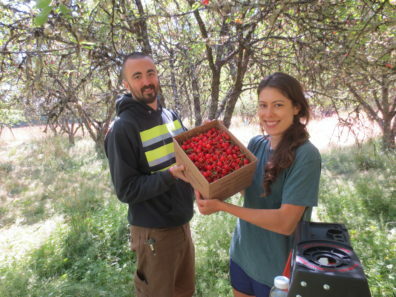 Contact the WSU Extension Gleaning Coordinator at 360-565-2619 or struett@co.clallam.wa.us to learn more. Do you have extra fruits and vegetables in your garden? Sign up to have a volunteer pick from your yard. The produce will be donated to local charitable organizations such as food banks, the Boys and Girls Club and senior centers. Contact the WSU Extension Gleaning Coordinator at 360-565-2619 or struett@co.clallam.wa.us to learn more. In Clallam County, 16% of households are often unable to buy the food their family needs. By gleaning, you can help those in need access fresh, nutritious, local produce that might otherwise go to waste. And you can save money on food for your own household by filling your freezer full of fruit, canning your own sauces and eating free, sun-ripened veggies fresh from the soil!